AMMONNEWS - An official source told The Jordan Times on Wednesday that no decision has been taken in that regard and when it is made when the situation is ripe, “it has to be in line with the national interest of the Kingdom”. The official stopped short of divulging any further information about the expected move when asked if there had been coordination under way with the Syrians and whether Jordan has specific conditions. Meeting with industrialists during the week, Prime Minister Omar Razzaz noted that after restoring security in Syria and Iraq, the border crossings with the two neighbours would be reopened and the three countries will work on enhancing economic cooperation. Local news reports have said that maintenance work at Jaber was under way in anticipation of the reopening. In an interview with Reuters on Monday, Syrian Transport Minister Ali Hammoud said the Syrian government had yet to receive any request from Jordan to reopen the crossing. “The road is ready to function, and accordingly we are studying the reopening of the crossing,” he said. The Syrian government has recovered control of most of the country with help from its allies Russia and Iran. This year, government forces have defeated insurgents in the last remaining enclaves near the cities of Homs and Damascus, and swept through the rebel-held southwest with Russian help, according to Reuters. 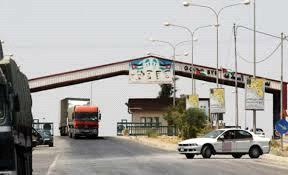 Billions of dollars in annual trade moved through the Nassib crossing before fighting erupted in 2011, and its closure has weighed on the economy of Syria and neighbouring states, Hammoud added.